Editor’s note: This is the second installment in our look at Istanbul’s top fıve street foods. It was written by Jason D. Jones, an American expat living in Istanbul. Although it’s been a staple food for many civilizations for over 2,000 years, the potato has largely been relegated to the role of side dish in most modern culinary settings. However, in Istanbul’s Bosphorus-side village of Ortaköy, the humble potato takes center stage for locals and tourists alike as one of the city’s most beloved street foods. Think of this Istanbul street food icon – known in Turkish as kumpir – as the baked potato on steroids, a motley mix of flavors piled high into an inexpensive meal roughly the size of a small child’s head. Kumpir stands are found all over the city but are impossible to avoid in Ortaköy, where there are probably more than a dozen kumpir stands in the immediate vicinity around the famous Ortaköy Mosque and at least eight of them sit side by side on a street appropriately known as “Kumpir Sokak” (Baked Potato Street). We recently visited the area on a Sunday to take advantage of the mild November weather and do a little shopping at the outdoor bazaar that fills the narrow streets around Ortaköy Mosque. After working up an appetite and running short of lira, Kumpir Sokak seemed to be just the place to relax, tame the hunger and still have money for a cab ride home afterward. A few minutes of observation revealed Maya Kumpir to be the most popular amongst the locals, so we strolled over to the counter where spud master Muhettin greeted us with a warm smile. We ordered our potato and gazed over the mind-boggling myriad of available toppings under the glass-enclosed case. As Muhettin split the potato down the middle and began mixing in a small amount of butter and kaşar cheese, we started pointing out our selection of toppings to be added next. Among the options were hot dog slices, corn, peas, vegetable salad, pickles, pickled beets, green and black olives, yogurt and even kısır, a couscous-like bulgur dish. There were more choices, but we were a little overwhelmed at this point and went with about five or six different selections, along with a spicy red-pepper sauce and some mayo to top it all off, effectively doubling the size of the already ample spud. The potato was perfectly cooked, soft and moist throughout, and the variety of flavors piled on top made for an interesting combination of tastes and textures. We’re pretty sure at least a few of the plastic spoonfuls didn’t contain any potato at all. Since there are, mathematically speaking, thousands of possible combinations, we’ll probably try it again and be a bit more selective in our choices. The peas, in our opinion, were just weird in that setting. Not that the hot dog slices were any less weird, mind you…. There are probably few places in Istanbul where one can go and have a full meal for less than 10 lira, while dining seaside, under the shade of one of the most stunning mosques in the world, and admire the sprawling Asian coastline across the water at the same time. And, though the seating is first come, first served and consists of park benches and stone steps, the show-stopping potato and its supporting cast of toppings make the kumpir an experience to behold. “Kumpir Sokak” is located on the main pedestrian street leading to Ortaköy Mosque and is hard to miss. Just look for all of the stands lined side by side. “Maya Kumpir” is No. 5. Small correction: the ingredient which was identified as couscous in all likelihood was “kısır” which is a salad made of fine bulgur similar to tabouli. Kısır is a standard kumpir topping. Thanks for pointing it out, burbaco. We corrected the mistake. Actually, couscous was what the guy at Maya identified it as. He pointed to it as he was loading up my spud and asked, “Couscous?”. I can say one thing, I just came back from istanbul. 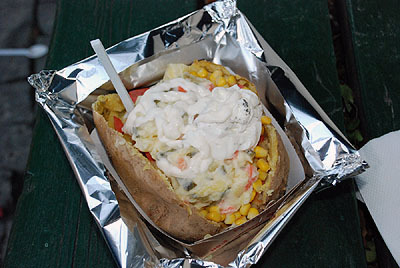 I tried this baked potato in istiklal st, a store called “potatos” in big orange or yellow color. they short changed me when I confronted the cachier about it, he tried to deny it. anyway just trying to say avoid this place if you go there because they’re thieves.